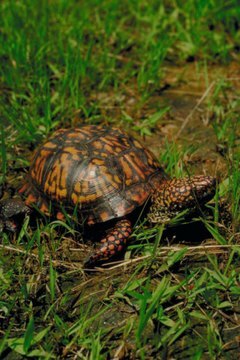 Box turtles can be found throughout the United States, both in nature and in many pet stores. Although most box turtles incubate their eggs in the wild, you can use a store bought incubator to hatch turtle eggs. Avoid removing box turtle eggs from nature, if at all possible. However, if you find a nest of eggs in danger, or if you have a pet box turtle who recently laid eggs, use an artificial incubator to help the eggs hatch. Adjust the incubator temperature to 80 degrees Fahrenheit and humidity to 80 percent. Fill half the incubator with moist peat moss or vermiculite. Carefully remove the eggs from their nest. Box turtle eggs are sensitive; they should not be shaken or rotated. Place the turtle eggs in the incubator. When transferring the eggs, be careful not to shake or rotate them. Monitor the eggs for 50 to 90 days. You should not move the eggs during this period, as this might prevent the turtle from hatching. When the turtles emerge from the shell, allow them to hatch themselves rather than assisting them. Leave the turtle in the incubator. Baby turtles may have a yolk sac attached to them. While they still have this yolk sac, leave them in the incubator. The yolk sac should only remain for a day or two. Remove the turtle after the yolk sac disappears. Place baby turtles in a terrarium with both water and dry land. Do not attempt to hatch wild box turtle eggs. Baby box turtles have a better chance for survival in the wild, if they are undisturbed. Bryan Saxton has been a professional freelance writer for more than eight years. A former reporter for the "Oregon Daily Emerald" and a former ITC employee, Saxton holds a Bachelor of Arts in public relations from the University of Oregon School of Journalism.